Xochitl Nguma at practice at Sharyland High School Wednesday, Jan 3, 2018, in Mission. MISSION — When Sharyland High freshman Xochitl Nguma was still learning to walk, her father made some slight modifications to her baby walker. Mesika Nguma cut out the front part, allowing Xochitl to kick a ball even before she nailed walking. 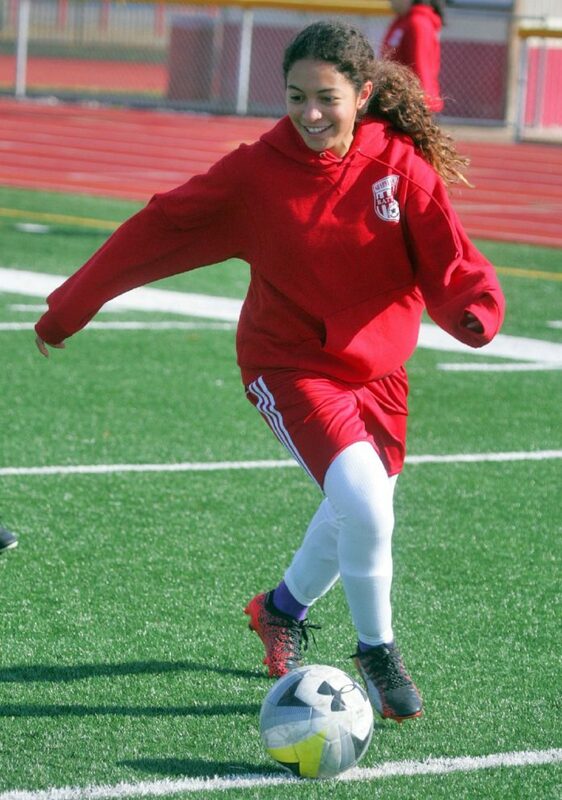 The elder Nguma has had a passion for the game his whole life, and in Xochitl’s first high school season, she showed that the apple doesn’t fall far from the tree. With 32 goals netted in district play and 40 overall, her stellar freshman performance earned her The Monitor’s Newcomer of the Year honors. Though she had success at the club level and was told she would adapt well to high school play, Nguma needed to learn the ropes and add some bulk to compete against girls who have been relying on physicality for years. She eventually found her scoring touch and built important chemistry with Kaitie Watson at the top of the Rattlers formation. Watson finished her strong career with 51 goals and 21 assists as a senior. Many of those dishes went to the youngster Nguma. The addition of Nguma to the lineup was mutually beneficial, as she and Watson drew defensive pressure away from each other. “In the beginning of the year, they would mostly mark Kaitie, so they would leave lots of spaces open for all the people in front,” Nguma said. Sharyland edged out rival Pioneer for the District 31-5A title. In her first high school playoff game, Nguma opened the scoring for the Rattlers and even drew a penalty kick on a play that gave her a concussion and ended her season. The soft-spoken, lanky No. 10 will be asked to take on an even bigger role next year as the team’s two top seniors — Watson and defender Elise Townsend — will have graduated. Along with coach Mario Ribera and his staff, Nguma has another, familiar voice guiding her. Meiska has tried to learn when to be hands-on and when to approach Xochitl as a father.